In conjunction with my SF360 interview with Marc Huestis regarding his Fabulous Fashion In Film Festival currently in progress, I recalled that in my vault of recordings I never transcribed last Summer's Mildred Pierce event, to which he had graciously comped me a pass. Though belated, I hope this will emphasize Marc's keen talent for showmanship, further interest in his current project, and encourage him to keep 'em comin'! We feast on his vision, here in San Francisco. 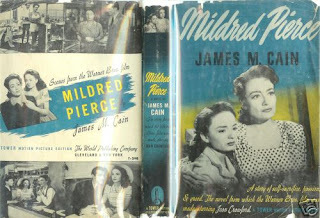 In his introduction to Mildred Pierce, featuring the onstage appearance of Ann Blyth, impresario Marc Huestis noted that—though the evening was an homage to Saint Joan—it was likewise an homage to Saint Ann and that Blyth had appropriately starred in a film entitled Sally and Saint Anne (1952). Huestis added that he would not be standing on the Castro stage had it not been for Ann Blyth. "When I was a mere young adolescent queen," he recounted, "I would watch the Million Dollar Movie in New York. My mother was a stripper and my father cut Hullabaloo at NBC. Anyway, there was a movie on Million Dollar Movie called The Helen Morgan Story. I watched that movie all week. I adored that movie. When I came to San Francisco in the mid-'70s, I became part of a theater group called The Angels of Light who were an offshoot of The Cockettes and I had a character who was a drag queen chanteuse—and I was a pretty ugly drag queen—and her name was Ellen Organ. One night I was performing and I had a bottle—because Ellen drinks and drinks and drinks—and I made a gesture and the bottle flew out of my [hand] into the audience and hit somebody on the head who had to go to the hospital to get six stitches. After that, I gave up my career as an out-of-control drag queen and became a filmmaker, which led me to become a producer. So because of that, I am here tonight and I have to thank Ann Blyth." Prefacing his montage of film clips from Blyth's career, Huestis described the process of watching Blyth's movies as "lifting the petals of a very delicate flower." Praising Blyth's "beautiful versatility" and commending her "amazing amount of class", Huestis delineated that Blyth's role as Veda Pierce Forrester was something of an anomaly because Blyth "mostly played the good girl", which he qualified was harder to do than playing a bad girl. Some of those film clips have been incorporated into a restrospective montage that Huestis pieced together to commemorate Ann Blyth's appearance on the Castro stage. Huestis invited the "Czar of Noir" Eddie Muller to interview Blyth on stage. Muller, in his introductory remarks, commented: "If James M. Cain were alive tonight, he would not believe what is happening in this theater. James M. Cain is—as I call him—the architect of Noir City. He is the man who is responsible really for what we consider to be film noir today. He started it by writing the books. He was a newspaper man from Maryland who moved to New York and decided to come West to California with great literary aspirations, whether it was going to be writing screenplays or novels—he wasn't quite sure—but he knew that his destiny lay out in Southern California. He came up a crocker; nothing really transpired when he got to Hollywood. He wasn't very successful as a screenwriter and no great novels emerged from him. In desperation almost he sent to his publisher a nasty little novella called The Postman Always Rings Twice. The Helen Morgan Story for you, Mark, it was The Postman Always Rings Twice for yours truly. "This pretty much set the blueprint for what we now know as film noir. He followed that up with Double Indemnity. But thinking somehow that these terse, nasty, gritty little potboilers were somehow beneath the man of his extreme literary aspiration, in 1941 he wrote a novel called Mildred Pierce that was his great epic, his fabulous satire of life in California and all about capitalism. He had a great knack for writing fabulous women and Mildred Pierce was immediately snatched up by Warner Brothers to be turned into a movie. Joan Crawford was nowhere to be seen at this point. That project languished at Warner Brothers for a couple of years until a man named Jerry Wald decided it was his time to make a mark as a producer. He had done a couple of things with Humphrey Bogart; Across the Pacific. 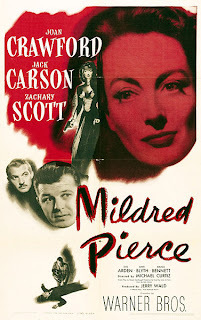 He'd done Background to Danger with George Raft; but, Mildred Pierce was going to his big breakout movie. 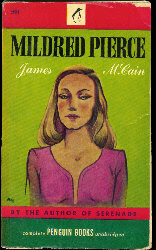 Initially, they wanted Bette Davis to play the part of Mildred Pierce. Rosalind Russell was considered to play Mildred Pierce. It was offered to Barbara Stanwyck. Ann Sheridan at one time was considered to play Mildred Pierce. When Mildred Pierce came out, Joan Crawford was at MGM; her time had come and gone. Or so it seemed. She ended up at Warner Brothers where she languished for two years waiting for a great part and—lightning in a bottle—Jerry Wald finally decided, 'You know what? I'll go with Joan Crawford.' And there you have it. History was made. I give Jerry Wald full credit for taking what was really not a noir novel and really not a crime story at all and pulping it up for the big screen. That's what we love about Hollywood, right? There was no murder committed in the novel Mildred Pierce. One of the first things Jerry Wald told Ranald MacDougall, the screenwriter, was: 'Let's do this kind of like Double Indemnity.' So you will see. The flashbacks are all over the place and there's a great opening scene that is so totally noir that it almost defines what noir is. A lot of you will still say, 'But it isn't really truly noir because there's no femme fatale.' To which I say, 'You must be crazy!' This movie has the most vicious, evil, mean-spirited femme fatale in the history of movies and it's so sick because her victim is her own mother. So without further ado, I give you what I think is the greatest melodrama ever made in Hollywood. Ladies and gentlemen, Mildred Pierce!"